So you’re not the crowd favorite. You don’t know a lot of people. Your friend request box is not overcrowded on Facebook. No one really knows you. You’re no where near 10,000 followers on twitter. The odds seem to be against you…but you’re right where you need to be. There’s a supernatural advantage working for the small! 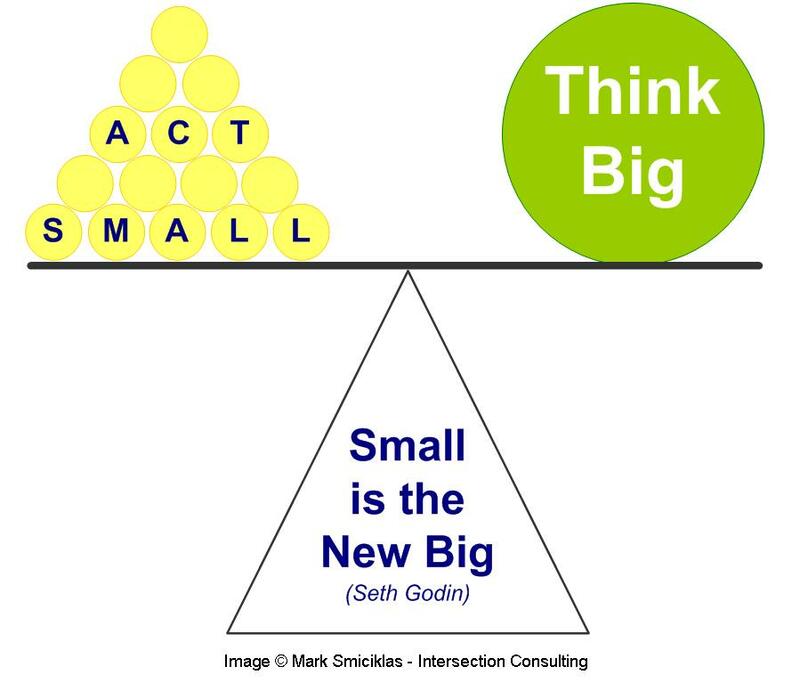 Jesus Mind Principle #3: Small is the new big! We need to begin to take advantage of the greatest shifts our generation is experiencing. First and biggest are the old-fashioned strategies of the day. Industries took pride in being big and powerful enough to control the masses. But the power has shifted into the people’s hands, thanks to the internet. In today’s “People-Power” age, the last and the smallest will win! You see, the small have ALWAYS been winning. Culture as a whole is not a reflection of the majority, but of a relatively small number of cultural leaders. In a Trinity Forum briefing written by James Hunter in 2002, he highlighted Randall Collins’ book “The Sociology of Philosophies.” According to Collins, civilizations since the beginning of time have always been defined by a small group of cultural philosophers. He pointed out that if we added up the number of individuals who significantly changed civilizations in all of it’s networks, we’ll get a total of 2,700. In sum, between 150 and 3,000 people (A tiny fraction of the 23 billion that have lived between 600 B.C. and A.D. 1900) have changed the world!…Clearly the world is changed by a few! Jesus taught us the last shall be first (Matthew 20:16). He also said the Kingdom of God will begin as a mustard seed (A very small seed) and then expand into the biggest tree. (Mark 4:31) He was revealing a JESUS MIND principle that before you are influential in the world and have huge presence, it serves you better to begin small. God started humanity with one man (Adam) not a multitude. God spoke to one man (Abraham) and blessed him to bless the world. God used one man (Moses) to deliver His people from Egyptian slavery. God used one man (Joseph) to save an entire nation from a famine, his form of a recession. Jesus started His church with just a few…12. They went on to reform the course of History. This is a theme throughout history. The Jesus Mind isn’t impressed by numbers. The one with The Jesus Mind understands the power of ONE. The world is getting smaller. Everyone is getting more and more connected thanks to social-networking and globalization. So don’t think you have to start big. One REALLY great and spreadable idea can go around the world in a few hours! (Remember KONY?) You don’t need the masses to be mega. The homosexual community is a perfect example to show how a small group of committed people can change the world. 4 million Americans identify to being gay. Wanna know how small that is? Just 4% of the population. See stats here. How bout the Al-Qaeda network that turned the world upside down with their terrorist attacks. They are not even 1% of the world’s population. So if you’re not gay or a terrorist, how do you start small? If you are launching a business, ministry, movement or career in some form of art (Music, writing, designing etc) reliably reach a small audience who WANTS to hear from you or see what you do. Build them, help them, connect them, invest in them, share and inspire those who actually care about what you care about. Jesus started small but He invested in His small. Make some noise. Don’t be afraid to speak up. The point is not to remain small. Do remarkably great work. Dedicate your time and creative energy to your passion and art. Share to your tribe. When it’s good, people will do the talking for you…and THATS what you want. Ideas spread better when you don’t have to do the talking. Believe…in yourself. Your God. Your Dreams. Your Art. Your Tribe. Enjoy and don’t despise being small. The world will see you in time. Your dream the size of a mustard seed can move mountains! Start SMALL, end BIG!